When you break down, it’s distressing.Brooklyn.Ben and Nino Auto Repair and Towing Service takes great pride in their reputation and their attention to detail.They take any auto challenge you might have as a personal mission. Not only are you stranded but you are faced with not knowing what to do.You need someone who can calm your fears, and handle your problems with respect and kindness, and get you back on the road as quickly as possible.When your car, truck or motorcycle isn’t functioning, you need a team that not only knows and handles what’s wrong, but has is a trusted name in Brooklyn.Ben and Nino Auto Repair and Towing Service takes great pride in their reputation and their attention to detail.They take any auto challenge you might have as a personal mission. 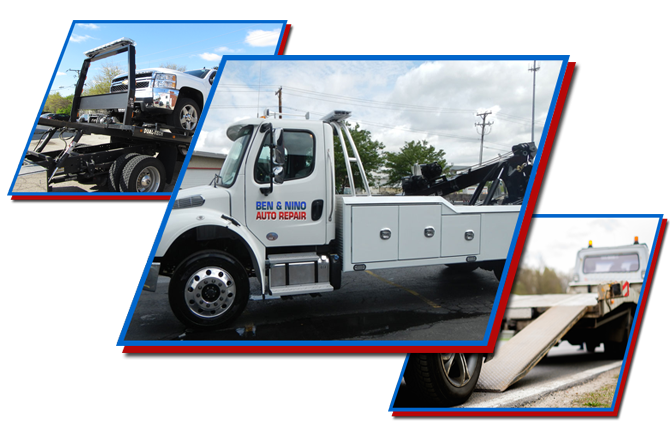 Their 24 hour, 7 days a week, 365 days a year Towing and Roadside Assistance are legendary and handle any need in the Brooklyn area. Not only do you want your vehicle towed, but you want it towed to a shop that can diagnosis the problem correctly, and give your car a complete check so that nothing is overlooked.Then, they discuss the possible repairs with you, and explain what and why they are needed so that you can understand what they see.They give you an estimate and then carry out any repairs quickly and effectively. They are ASE Certified and all work is executed by qualified and highly skilled mechanics who care about your satisfaction and safety. Ben and Nino are a full service shop providing the simple work like oil and filter changes and lube jobs, however they also provide many complex repairs as well.Give them a call to see all they can do for you to keep you on the road.